In this article, I consider the distinctly classed places/spaces in which affluent Australian pregnant women physically maintain their bodies through aerobics. The case study described is drawn from data obtained between 2006 and 2008 in a longitudinal study examining feelings about body image and ‘fatness’ in a sample of pregnant women in Melbourne, Australia. 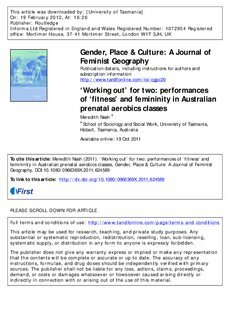 The ways in which pregnant bodies are disciplined within gym spaces are discussed through a case study of a prenatal fitness centre, FitForTwo, and drawing on narrative data of pregnant informants. FitForTwo is described as a primary site for the performance of ‘fit’ pregnancy and underscored by bodies that can be shaped, trained, moulded and modified. This case study is analysed against a backdrop of a growing Australian moral panics about ‘fighting’ maternal obesity. It adds to a body of feminist geographical and qualitative studies of pregnancy, bringing both a more sustained, longitudinal analysis than previously offered, and an Australian context that offers rich comparative material.